Known for their trademark larger-than-life performances and fantastic stage outfits, KISS have proven for decades why they are one of the most iconic live acts in rock’n’roll. Having sold more than 100 million albums worldwide, the Rock & Roll Hall of Famers’ hits include Detroit Rock City, Shout It Out Loud, I Was Made for Lovin’ You and Rock and Roll All Nite. The American rock band formed in early 1973 in New York City and became known for their elaborate make-up, costumes and live performances, which often featured pyrotechnics, fire breathing, smoking guitars, shooting rockets and even levitating drum kits. 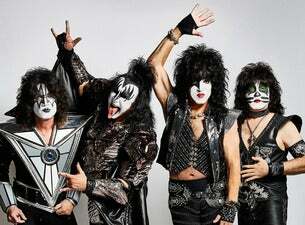 Original members Paul Stanley, Gene Simmons, Ace Frehley and Peter Criss adopted comic book-style characters, including The Demon (Simmons), The Spaceman or Space Ace (Frehley), The Starchild (Stanley), and The Catman (Criss). Due to creative differences, Frehley and Criss left KISS in 1982, which lead to several line-up changes over the years. Current members Tommy Thayer (since 2002) and Eric Singer (since 2004) took over The Spaceman and The Catman, respectively. In 2019, KISS are celebrating their massive career with a final world tour, aptly named the End of the Road Tour. It will see the band play classics from their iconic four-decade career and 24 studio albums.